Every year, NFL teams sign marquee free agents at every position while they draft younger players to fill other holes in their roster. Contract language sometimes delays even the most “NFL-ready” rookies while other disputes in contracts take centerstage during the league’s offseason periods (see Roquan Smith, Le’Veon Bell, respectively). With all that in mind, we at PFF have devised a method of looking at the league’s best contracts as we enter the 2018 NFL season. We wanted to know which teams have the league’s best players under the lowest amount of guaranteed, annual money and which of those athletes had been standouts at their respective positions. To do so, we utilized our data scientists Eric Eager & George Chahrouri’s recently revealed Wins Above Replacement metrics for every NFL player who has signed a contract after their rookie deal. To qualify for this study, a player must be at least one year into their second contract in the league, under contract for at least the 2018 and 2019 seasons and logged at least 1,000 snaps over the past three seasons. Combining all of the data with PFF grades from Premium Stats 2.0, the question still remained: which NFL players at each position produced top-level WAR values, based on the amount of guaranteed money per season and the amount of money they’ll be due after the 2018 calendar year. The formula developed was essentially that, and the results were very appealing. Are teams paying the premium for top-notch players at each position? Are there individuals who are currently outplaying their contract value? All of that information granted us the ability to isolate a player’s three-year average WAR value over their guaranteed salary (both this season and remaining) to take a look at which players are signed to the best contracts at their positions, with respect to their peers. All contract data comes from overthecap.com. 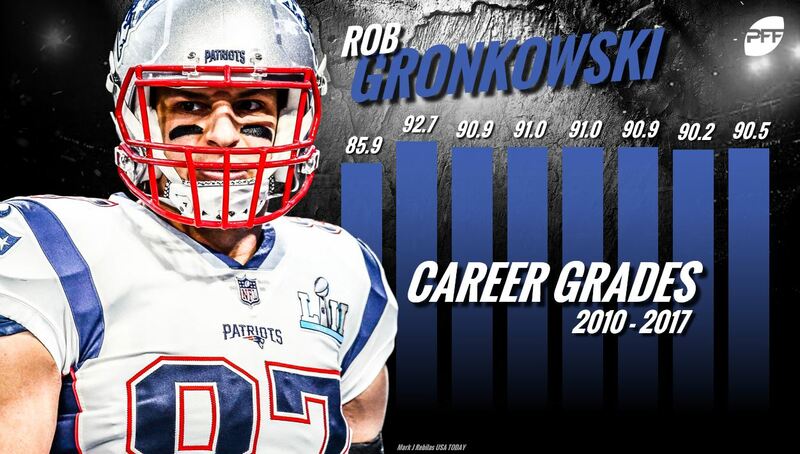 Gronkowski is the most dominant tight end in the NFL, and his Wins Above Replacement level value of 1.81 is a considerable step above the rest of the players at the position. Staying on the field has been the only issue for him, but with just 24 percent of his salary guaranteed, the Patriots are somewhat protected there. Since arriving in the NFL, his rookie season is the only year that he produced a PFF grade of under 90.0 on offense. Olsen is one of only a few tight ends to have a Wins Above Replacement level value above 1.00 over the past three seasons. An outstanding receiving tight end, Olsen produced a PFF receiving grade of 80.0 or better every season between 2012 and 2016, before injuries limited him last year. In 2016, his yards per route run average of 1.9 was tied for fourth among tight ends who saw at least 50 targets. Kelce is another tight end who has produced an average Wins Above Replacement level value above 1.00 over the past three seasons, and he gives the Chiefs solid value with just 23 percent of his contract guaranteed. He led all tight ends in our yards per route run statistic in 2016, and he finished second to Gronkowski at 2.0 in 2017. 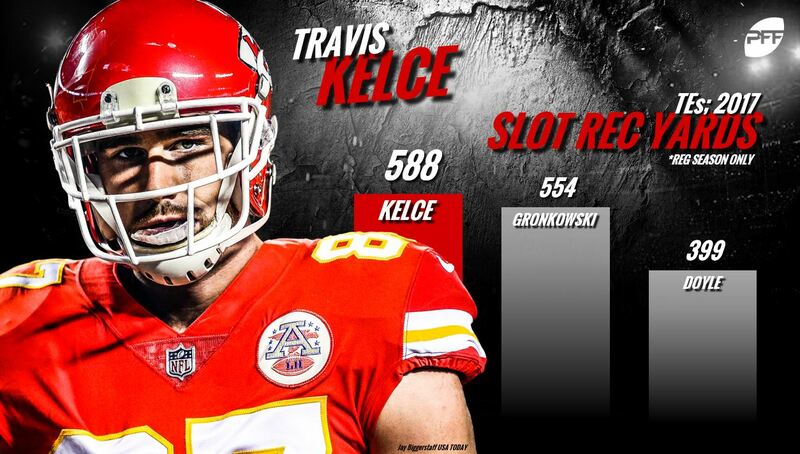 With the size and skill to be a mismatch weapon in the passing game, Kelce has done damage when lined up in the slot and in line, producing PFF receiving grades of 88.5 and 87.1 over the past two seasons. The Buccaneers are in great shape at the tight end position with Brate and last year’s first-round draft pick O.J. Howard. Brate was tied for ninth at the position with an average of 1.4 yards per route run last year. An undrafted free agent in 2014, Brate has produced PFF grades of 80.5 and 73.6 on offense over the past two seasons. While the focus will likely be more on Howard in 2018, opposing defenses shouldn’t sleep on Brate when the Buccaneers have the ball considering the impact he has made over the past two seasons. When healthy, Reed is one of the most dynamic playmakers at the tight end position. He was tied for ninth among tight ends with an average of 1.4 yards per route run in 2017. One of the toughest matchup problems for linebackers and safeties, Reed has produced PFF receiving grades of 87.0 or higher in three of the past five seasons, and if he can stay healthy in 2018, he’ll be the perfect target for Alex Smith in Washington.